Hello Kitty! Have Some Art! Think of your favorite so-cute-it-hurts art meme, and chances are at some point it was inspired by the success of Sanrio’s Hello Kitty line. The little white cat with tiny black eyes (first designed in 1974 by Yuko Shimizu) has become a billion-dollar yearly world phenomenon since first breaking out of Japan in 1976. Now, this October Abrams will bring us Hello Kitty, Hello Art!, a hardcover collection of kitty-inspired illustration. “Hello Kitty, Hello Art! is a celebration of the iconic Hello Kitty character and other beloved Sanrio characters through the eyes of dozens of contemporary artists and Hello Kitty fans, including Gary Baseman, Ron English, Luke Chueh, CRASH, Anthony Lister, Eric Joyner, Camilla d’Errico, Amanda Visell, Colin Christian, Huck Gee, Luke Chueh, Deph, and Yosuke Ueno, among others. 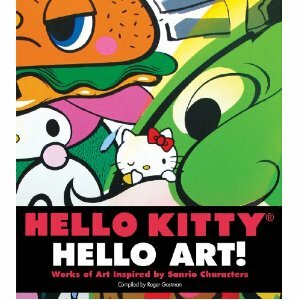 This hardcover collectible book features a variety of well-known international artists and their unique interpretations of Sanrio characters in various media, including canvas, spray paint, watercolor and ink, aerosol and acrylics on wood, mixed media, oil on panel, and silk screen. The pieces in the book reflect the many ways Hello Kitty and Sanrio have influenced and inspired so many artists around the world.” Pre-order it on Amazon.